Many centuries ago, lions were one of the most numerous animals on earth. Today, their range has been decreased more than any other animal. Even in the conservation haven of Namibia, their populations are now confined mainly to the Northern reaches of the country. Fortunately, they are still within reach of your Windhoek accommodation, and it is really worth travelling to see them during your holiday. While the incredible desert-adapted lions of the Kunene are the most famous subset of Namibia’s feline inhabitants, the King of Beasts has also taken up residence in the woodlands of Etosha National Park, Caprivi, Kaokoland, Bushmanland and Khaudom Park. A number of lions have also been re-introduced to Kalahari Game Lodge along the South African border. Here they roam over huge territories, some up to 400km2. Most of the Namibian prides have about 10 members, consisting of an alpha male, related females and their cubs. They spend their time hunting, keeping tabs on their boundaries, playing and sleeping. During the heat of the day, when most safari-goers see them, they tend to be sleeping – which has earned them a reputation for laziness. Lionesses rarely leave a pride, while all male lions leave their maternal home at about 3 years old to fend for themselves. They usually gang up together in order to thrive, but few survive the harsh realities of life as a male lion. Only about 1 in every 7 male cubs ever manages to survive to adulthood, overthrow another male and inherit a pride of their own. The largest population of lions in Namibia occurs in Etosha National Park. The lions of Etosha are one of few populations worldwide that are free of Feline Immuno-deficiency Virus (FIV). This, along with no signs of Canine Distemper or Bovine Tuberculosis among Etosha’s lions makes them the top cats among Africa’s lions, and vital to lion conservation. 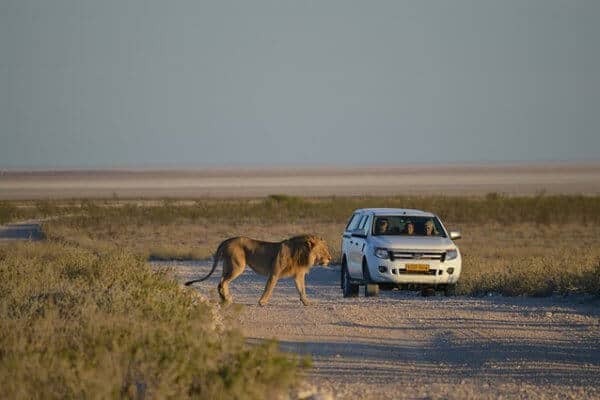 Most visitors to Africa have lions at the top of their wish list for sightings, and Etosha does not disappoint. Lions are often seen by tourists here, usually around the Okondeka and Ombika waterholes. Their large size makes them easy to spot when in motion among the sparse environment of the park, despite their tawny camouflage. Kills on wildebeest, gemsbok and zebra are often reported by visitors to Etosha. Known as some of the fiercest of Africa’s lions, Etosha’s cats have even been known to take down small elephant and hippo. If it’s lions you would like to see on your visit to Namibia, head for Etosha National Park. Alternatively, you could take a day trip and visit a worthy rehabilitation centre such as the AfriCat Foundation at Okonjima Private Nature Reserve, where you can make a donation or even adopt a carnivore!